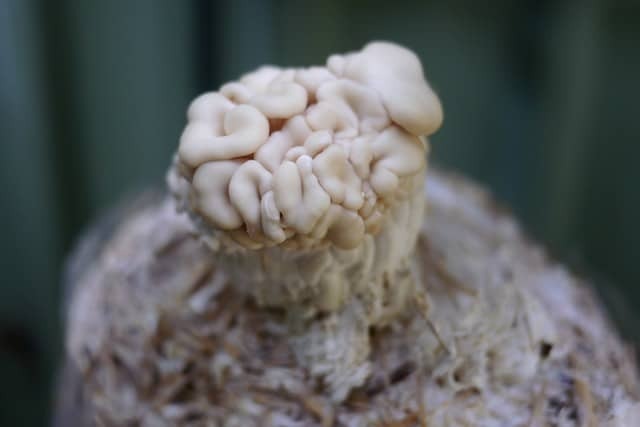 One of the great things about home mushroom propagation is that it can be entirely portable. Lease ended? No worries – pack up your bags, buckets and logs, and off you go. Your food supply comes with you. Which is good news for renters, like us. 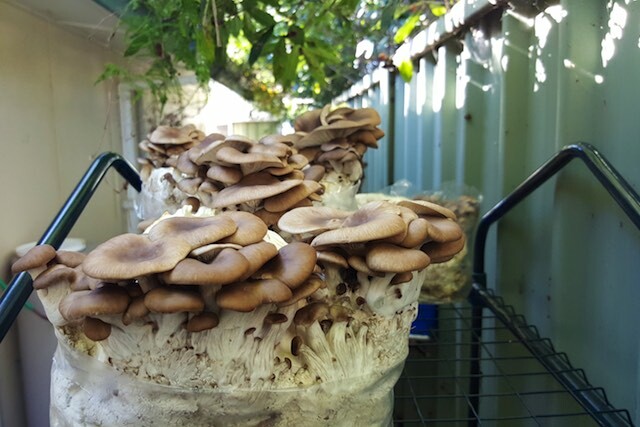 Unlike our veggie garden, when we had to move house recently (ah the joys of renting), we simply brought our mushroom bags, buckets + logs along with us, and set them up in a new spot. 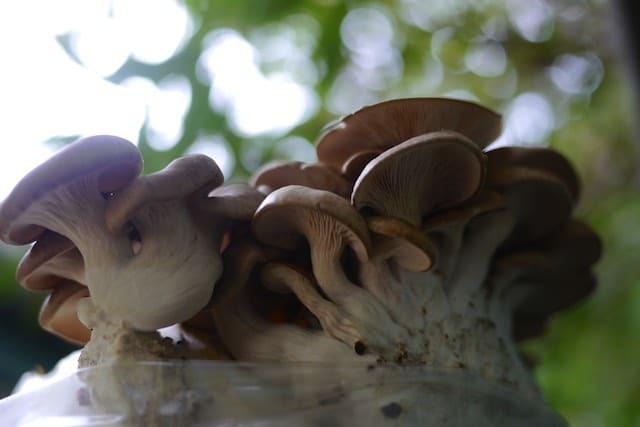 I think our fungi liked the move. We’ve found a humid place down the side of our shed that’s shady yet breezy yet damp. 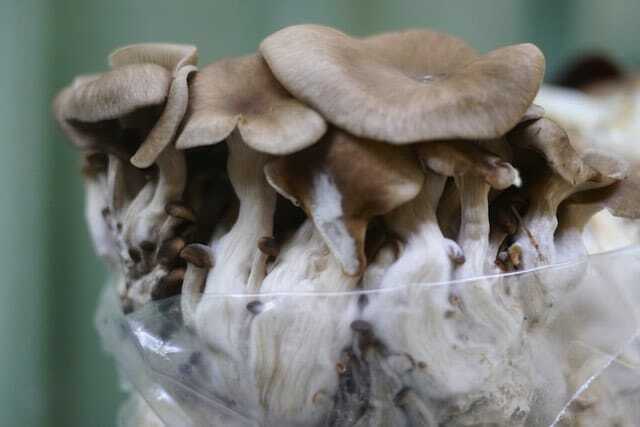 Perfect for fruiting mushrooms. 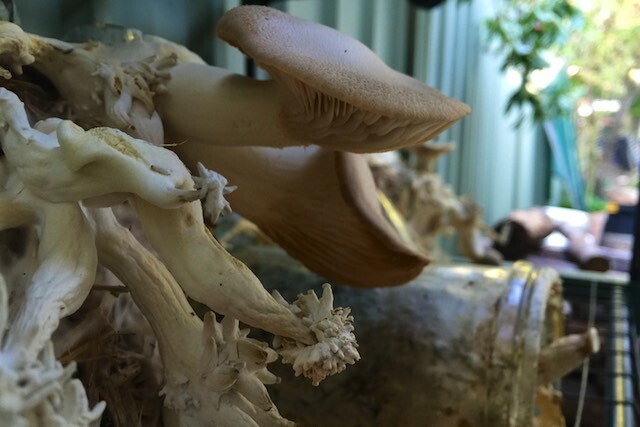 And so we’ve set them all up – our slightly random assortment of bags, buckets and logs full of pearl oysters, shiitakes + king stropharia.On with the show. The harvest is random because we don’t have a ‘on Thursday nights I inoculate buckets of substrate for regular harvest’ rule happening around here. Life is busy. And so we ‘do mushrooms’ here and there, when time allows. 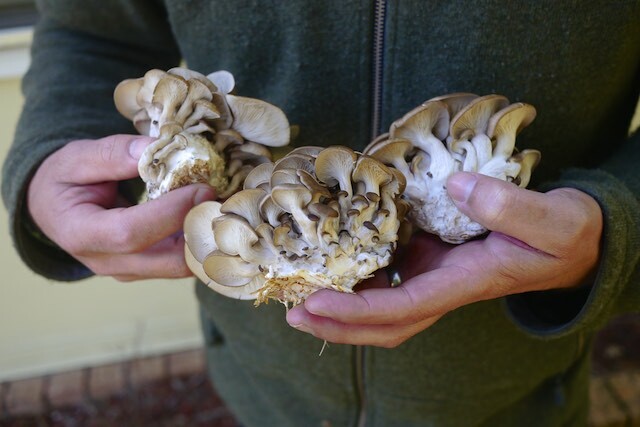 And occasionally, we get a big flush of mushroomy goodness. 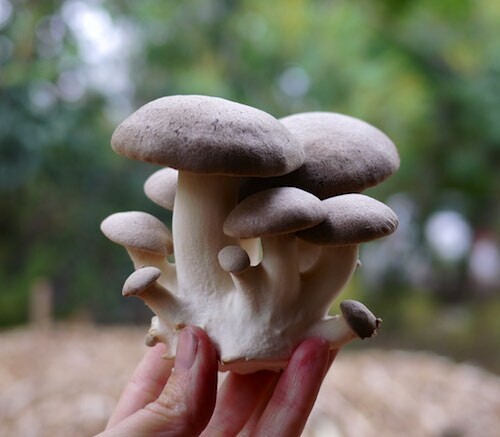 Which we dutifully devour, usually with garlic or with garlic and cream, because we’re yet to find a better way to cook beautiful fresh home-grown mushrooms. Except maybe with some pasta thrown in, as below. There’s a line in Mrs Beeton’s Book of Household Management where the recipe for Jugged Hare begins with ‘First, catch your hare’. I always think about that line, whenever I’m cooking with homegrown food. 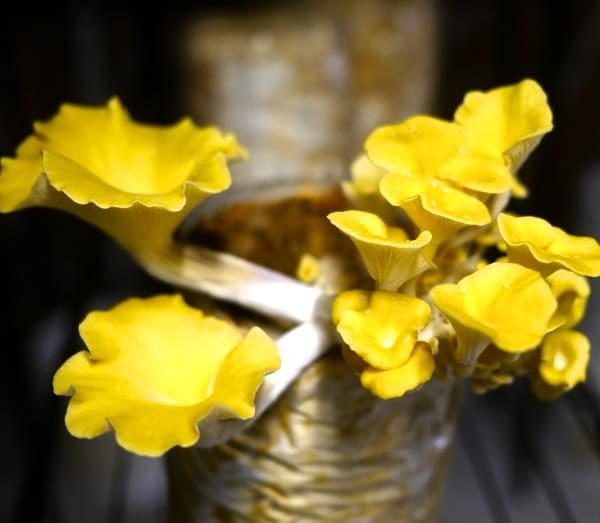 ‘First, grow your mushrooms.’ But if you do have to buy them, that’s ok too. I understand. 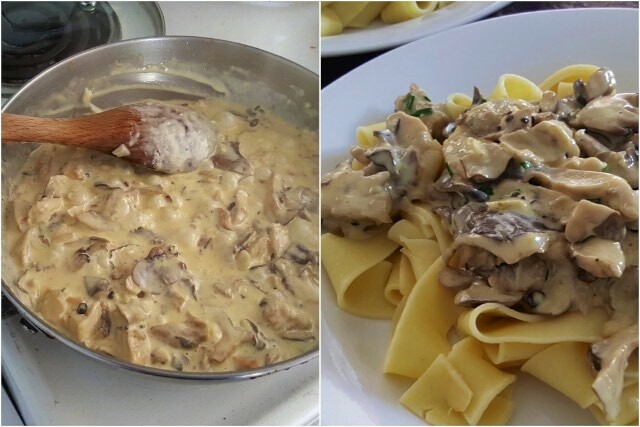 I think Mrs Beeton would have liked Nick’s Pappardelle al funghi. 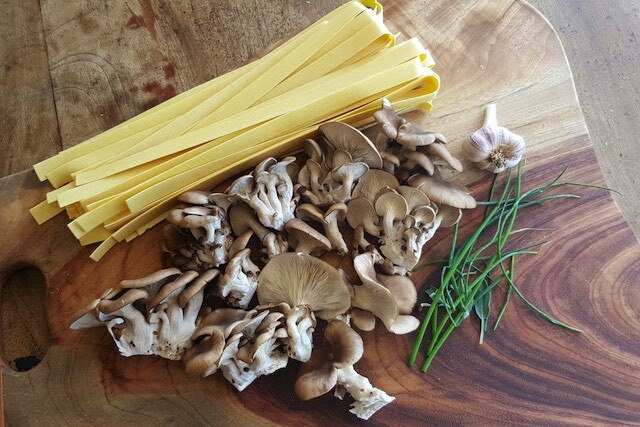 For this dish we grew the mushrooms + the herbs, adding a friend’s organic garlic, local cream and some locally made pappardelle (though if you want to make the pasta yourself, you should). Melt a good knob of butter in a large pan and add the mushrooms + garlic. Cover and simmer for a minute or two. If you need to halt the process to boil the pasta, do it now. 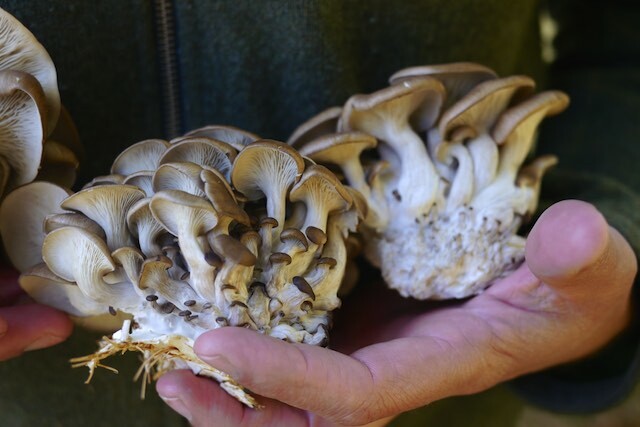 Take your mushrooms off the heat and set aside. Boil the pasta in salted water and drain when ready. Then, add a good slop of fresh cream to the mushrooms and simmer them till everything is nicely combined. 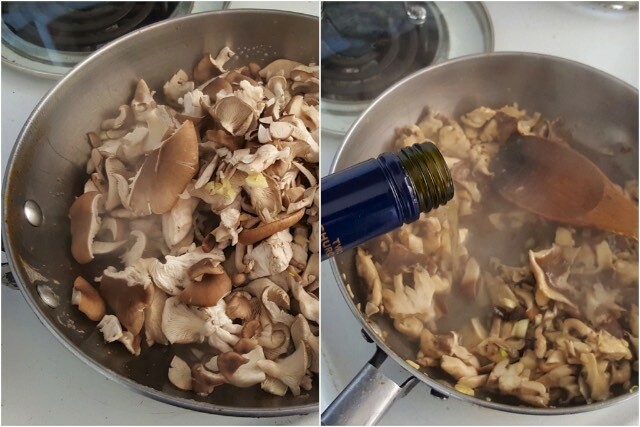 When cooking mushrooms, less is more! Season to taste if need be and spoon sauce over papperdelle. Grate on a bit of pecorino or parmesan cheese over the top if you have it (we didn’t, never mind). Take your plate somewhere warm and lovely, and proceed to fall about in the bliss that is a meal of fresh mushrooms combined with garlic + herbs + cream. And pasta. Definitely not an everyday food, but jeepers, what a treat. I’m a big fan of strike-and-retreat seasonal eating. When it’s available, hooray. When not, there’s always our cupboard full of passata. Simple is good. What’s your favourite way to cook mushrooms? I’d love to hear. I’m dreaming of a mushroom pie next. 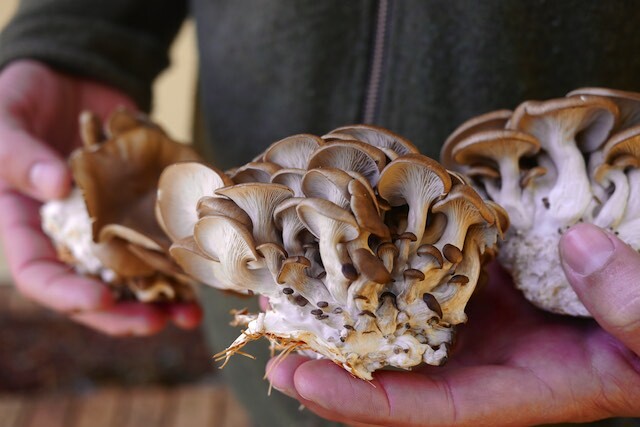 We run Gourmet Mushroom Cultivation courses for folks who want to grow. 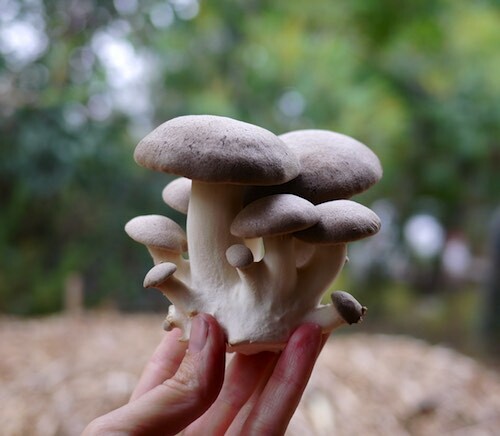 And all our mushroom how-tos + articles are here. Just so you’ve got them. Best Passata Day ever! 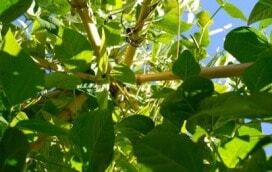 Great tomatoes, even better company and a . .
Bean Tipi Seeds – Who Wants Some? Last year we had a rather great success with our Bean tipi - it f . .